The GOLD PRICE backed off $4.30 (0.3%) on Comex to close $1,144.70. SILVER coughed up 32.8 cents (2%) to $15.76. Yesterday they looked awfully tired, so this little dip shouldn’t surprise anyone. Right about 9:45 this morning somebody — who I don’t know — commenced selling a lot of silver, and then gold. That drove them down to the day’s lows ($15.43.5c and $1,137.40) but by noon they had fully recovered. Not even the FOMC minutes bothered ’em at noon-thirty, then about 4:00 both shot up, then fell back. Right now trading at $1,139.20 and $15.72. All in all silver and gold showed themselves pretty stout. The GOLD PRICE first target here is getting above $1,156.40, that last (September) high. Once through that it will jump sure enough. 200 DMA stands only $23 higher at $1,176.59. A breach of that mark will make gold much more technically attractive. About that same place gold will meet the downtrend line from October 2012, which it hasn’t been able to beat for 3 years. Punching that won’t hurt gold a bit. That ain’t plainspoken, is it? I mean both (1) that will attract buyers, and (2) it won’t strain gold at all, it has plenty of strength for that. SILVER fulfilled my expectation for a correction today with that $15.43 low, but I will extend that to $15.23, a 50% correction of the foregoing move. I also would not be surprised if silver jumped up tomorrow. Something’s going on behind the curtains that we can’t see, some trouble brewing that’s dragging that US dollar index down and pushing silver and gold up hard. Maybe it’s Deutsche Bank in trouble, maybe Glencore, maybe something else we peons can’t see, but we can see its roiling markets, like wind stirring the treetops. All is not well in central banking land, or in the mighty welfare-warfare economy. ‘Tain’t ever easy. Markets like to torture you. Bull market wants to shake off all riders, bear markets want to maul everybody. Just got to live with the annoyances. Take today, for instance. Stocks shot up and the Dow passed, by a smidgen, its September rebound high (17,050.75 against 16,739.95). Why, if this was your first picture show that’d be liable to scare you out of your seat. But then you glance at the news and see the Fed Open Market Committee released minutes (surely not doctored!!) of its last meeting, the one where it blinked and swallered but didn’t raise no interest rates. Turns out the Fed geniuses sounded plumb scairt to raise rates, maybe even till some time in 2016, the later the better suits them. That news came out at 12:30, and right then stocks, which had been underwater, shot up at the thought of another six months of Fed subsidy. Now that might make stock prices rise — today — but that don’t make them no more valuable. So you might want to factor that in while you’re watching the stock market. If stocks need cheap tricks like that to rise, well, they ain’t just prime healthy. Dow rose 138.46 (0.82%) to 17,050.75 while the S&P500 added 17.6 (0.88%) to 2,013.43. Just like a nat’ral born durn fool climbing out on a limb with a saw in hand, I’m gonna say here that either today or tomorrow will mark the top of stock’s rise. Maybe that US dollar index is even sicker that I give it credit for. Dropped 17 basis points (0.18%) to 95.41 — was as low as 95.04 at one point. Hath now fallen through the support at 94.50. More, I am bold to say that I believe there hath formed a rising wedge on that US dollar index chart, and today it punctured the bottom boundary. If so, that whispers that the dollar’s parachute is about to fail to open. Euro rose 0.31% to $1.1272. It’s above its 20 DMA, and has broken out of the very tip of an even-sided triangle, but sure doesn’t seem in any hurry to rise. Yen rose 0.09% to 83.39. Chart looks much the same as the euro, breaking out upside from an even sided triangle, but with no take-off. US treasury 10 year note yield rose today, but why, with the FOMC minutes showing confusion and reluctance to raise rates? Because the dollar fell. I reckon. Y’all remember that a few days ago Catalonia voted in a kind of straw plebiscite to secede from Spain? Well, now maybe Bavaria is thinking about seceding from Germany. Bavaria used to be a kingdom of its own. ‘Pears they don’t fancy being the dumping ground for all those migrants. Bavaria’s premier says it might send refugees back to Austria. Somebody’s gonna lose this shovin’ match. West Texas Intermediate Crude oil rose 2.7% today to $49.43 a barrel. 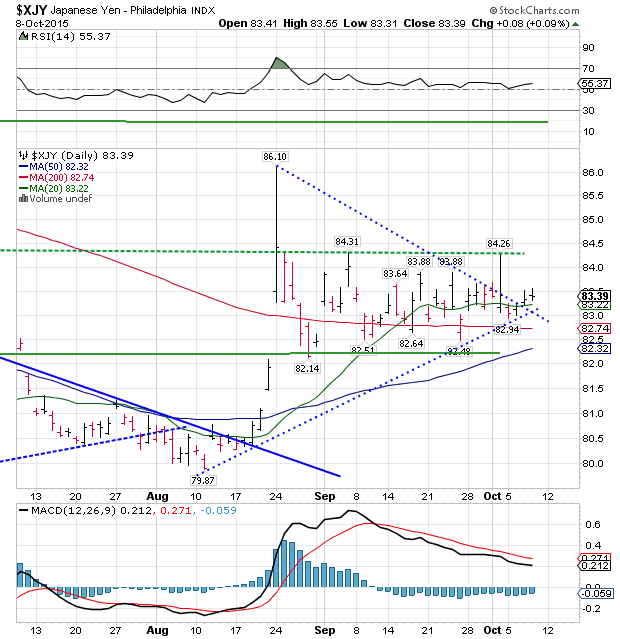 Has broken out of a pennant and is heading for the 200 DMA at $51.06. 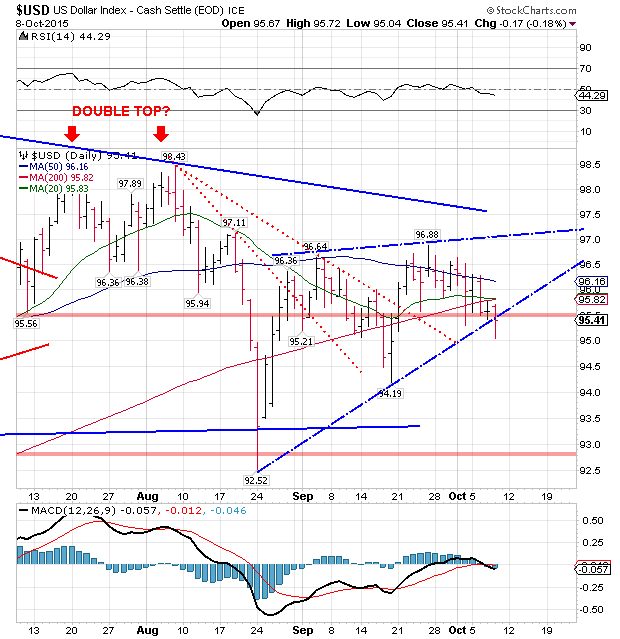 Copper looks to have double bottomed. That’s about right — just about the time the deflation scare reaches its peak, commodity markets, which have been battered for a year, turn up, signalling the inflation to come.